Mmmhmm. Another ice cream. What can I say. When the vision appears, there’s nothing you can do but meet it head on, climb on top of it, and skilfully fly it round like a hovercraft till you can alight upon the grassy knoll of recipe-confidence. Let that extended metaphor be a red flag that warns you not only of my 3am bedtime last night, but also of increased potential for further extended metaphors. 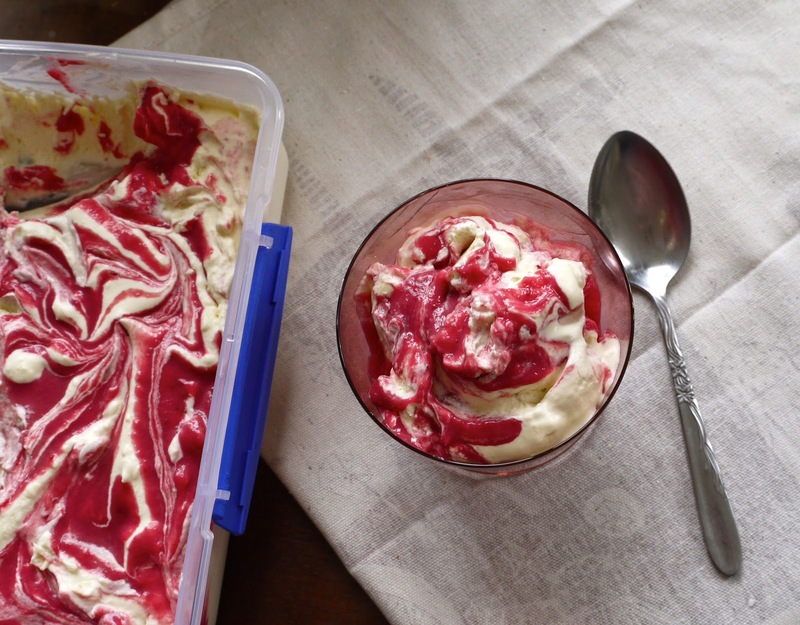 Anyway this ice cream leapt to mind fully-formed, no need for contemplative hovering: Cranberry Curd and White Chocolate Ripple Ice Cream. Cranberries are pretty synonymous with Christmas food, and if they’re not for you they will be after reading books by Nigella Lawson. But I’m a fan any time of year, despite their kinda maligned image. They’re not as give-it-to-you-on-a-plate sweetly juicy as strawberries, not as popular as raspberries, not as purple as boysenberries and their medicinal purposes aren’t as dinner-table-conversational as blueberries. In fact cranberries are like the grapefruit of the berry world: sour, prone to bitterness, with connotations of…groin. Luckily Nigella Lawson’s here, with her recipes for cranberry sauce and cranberry stuffing and all kinds of good Christmassy things, to save the cranberry’s image. The method looks really long and complicated but there’s nothing to get uncomfortably nervous about – apart from a particularly brutal sieving segment, the cranberry curd is delightfully untemperamental – and then you just half-heartedly whisk some cream, mix them together, admire the swirly prettiness like it’s your 6th form art board and you’re impervious to criticism, then let the freezer do its thing. My advice is to go slowly and calmly at all stages. I was on some kind of clumsiness roll and ended up doing many stupid things, like flinging cranberry curd everywhere and getting cream in my hair and wailing about curd on my tshirt before realising there was a slowly descending splodge of cream that had been there for even longer. Oh, and accidentally dropping all the remaining cranberries out of the sieve into the carefully strained mixture below. And dropping cream on the floor. It was like that scene with McNulty and Bunk in Season 1 of The Wire but with “WHY AM I SO CLUMSY” instead of one specific expletive used as my only dialogue. Mercifully it all ended up okay. More than. Bring the cranberries and the water to the boil in a small pan till the berries are softened and have released their juices. Now comes the one horrible job. You have to try push all this through a sieve into a bowl. There’s a technique – go slowly, keep pressing down and stirring with a spatula and then scraping the underside of the sieve with that spatula. You should end up with around 1/3 cup cranberry matter and a permanently clogged sieve. From here it’s simple though. To the strained, velvety pink liquid add the butter and sugar and gently melt over a low heat, then beat the eggs and sieve them into the pan while stirring (ordinarily a pain but you’ve already got a dirty sieve, so?) continue to stir over a low heat until it has thickened a lot. Don’t let it overheat and curdle after all that trouble – if you suspect shenanigans, just remove it from the heat and keep stirring. Allow to cool. Stir in a few daring drops of red food colouring if you like – this particular time I did. Meanwhile, whisk the cream till it has thickened and has increased in body mass but isn’t at the point where you’d call it whipped. Fold in the shards of white chocolate, and spatula all this into a freezer-proof container. Tupperware lunchboxes like the one I’ve used here are perfect. Ripple technique: I worked this out on the fly, as the spoonful of curd hovered questioningly over the container of whipped cream. Firstly, spoon the curd into the container of whipped cream in three rough horizontal lines (across the width, like a bumblebee) then take the handle of a spoon or a skewer or something, and make lines up and down across the length of the container, through the stripes. From here, carefully swirl all this around till you’re happy. Just remember you can’t un-swirl, so go slowly and carefully. All these surrounding ingredients really truly mellow out the cranberry, leaving it velvety and intriguingly sweet and berryish without any of that mouth puckering, tooth-coarsening quality that you might expect. 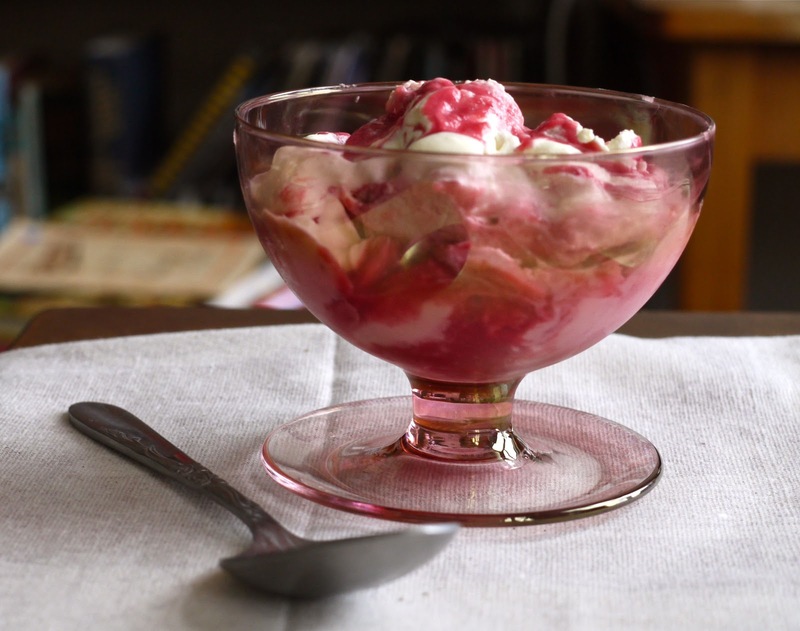 The stripe method of swirling means everyone’s guaranteed a decent portion of sherbety cranberry ripple to dissolve, and white chocolate is so delicious that I almost don’t want to demean it by explaining why it’s there, but its rich sweetness works perfectly with the ingredients and lends an alluring crunch to all that smoothness. I’m proud of myself for this one. So I’m super tired because it has been a big weekend of activity, from a raucous book group on Friday night followed by a catch up with a friend at Havana, Saturday’s plans for mini-golf were dashed upon the raindrops, but we all went to Denny’s and ate a whole lot of food (including a proper coke float) and followed it up with a Whisky Appreciation Evening that carried on long after the night had turned into the next morning. That’s what weekends are for, but now my brain’s feeling a little frantically underslept – if nothing else I can lean on this container of ice cream, cool my fevered brow, and spoon it into my mouth while I’m at it with but a minimum of effort. Just like the ice cream itself. I feel like it’s not too early to start thinking about Christmas-related things, but if you do, then maybe come back and re-read this post in three weeks so you can absorb it more comfortably? Title via: Eurythmics, Who’s That Girl – so our Whisky last night was Scottish, but I didn’t realise babein’ Annie Lennox was too. This song doesn’t encroach on Thorn In My Side’s Favourite Eurythmics Song territory, but it’s still damn good. Mos Def, Rock’n’Roll. I absolutely love Jack White, truly, but I was a little surprised he didn’t get mentioned in this song. Underworld, Rez. So twinkly and light and gratifyingly endless. the horrible job. at least they are not cherries, and don't have pips. i tried making fruit leather with 2kg of otago cherries. worst idea ever. the straining was a nightmare. it felt like my kitchen had turned purple, and all my baking paper was covered with pools of dark purple leather in varying stages of cooked. shudder. i might make a vegan version with more of a cranberry coulis as opposed to a curd ?? .. hmm! Hovercrafts and grassy knolls, tee hee! That cracked me up a little bit. I really can't enjoy white chocolate unless there's something nice and sour (cranberries!) or salty (pretzels!!) to go with it. Well done, this looks beautiful. 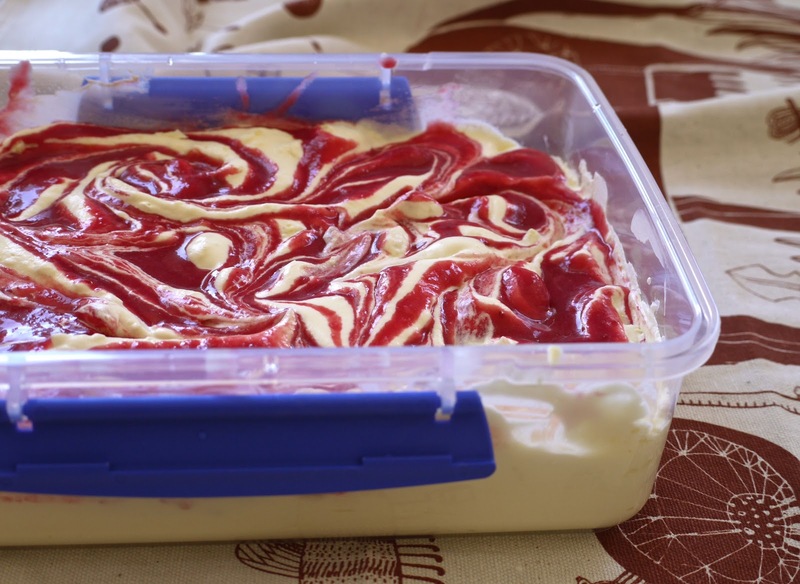 Looking at the swirls in your ice cream reminds me I wanted to bake a specific cheesecake. Your ice cream is just perfect for today's sunshine ! Really want to grab the spoon and dig in ! Don't you just love how Nigella gets us all worked up and into the Christmas spirit? Your post reminded me to get Feast out and make her Easy Action Christmas cake… the easiest and most amazing fruitcake ever. I think it would be pretty amazing with a scoop of your ice cream. Soooooooo delicious looking! This ice cream has stopped me in my tracks. 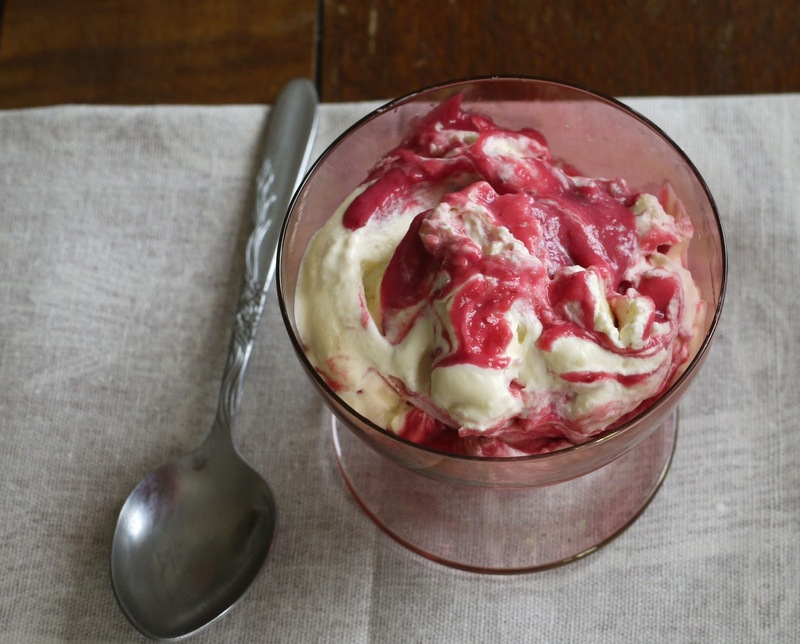 It's one of those recipes where it gets better with each word (ie cranberry, ice cream, white chocolate…)! PS: I have hinted at How to Eat for Christmas, based on your rave reviews, by the way! I'm always proud of yo'self, Laura. Forever'n'ever amen! Even if I wouldn't be very good at a Whiskey Appreciation Evening. I'd take a sip, screw up my face, take a bigger sip, screw up my face, hand the not-empty glass back, and then go dance on the coffee table like a lemur. It looks so beautiful & I love cranberries so festive…one day I will put on the full Nigella Christmas fest 😉 Thinking the cranberry curd could be the perfect Christmas gift for my supper club girls so thanks! YUM! I want to lick the screen,look at that swirl! Any ideas for a lychee and lime sorbet? The brand I used to buy discontinued the flavour. You've inspired me to have a go now. Thank you SO much for bringing this ice cream along tonight! My stomach hasn't exploded yet despite my 'one little spoonful' turning into about four. I couldn't help it, so fraking good. Funny. I love trying out different curd recipes, and last weekend I had a potentially genius epiphany to make a tangerine meringue pie for Thanksgiving next week out of tangerine curd. 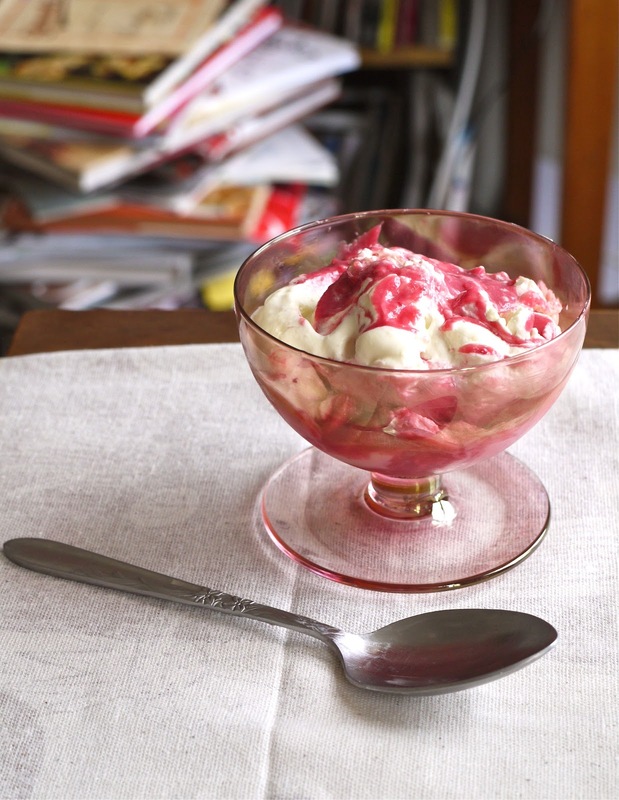 But cranberry meringue would be a bit more seasonal…. do you think it would be flavorful enough to star in a pie? So delighted to have stumbled on your site. And here is a tip that I think you might enjoy. A food mill. In the states it is sometimes called a Foley, a Mouli(moulineaux), in France(brand names). I will be using your recipe tomorrow, and the food mill will efficienty and easily extract the juice leaving the skins and seeds behind. I make a smooth tomato sauce by cutting off the ugly bits and cooking gently until soft. No need to core, seed and peel. Globe artichoke soup is a bit more of a bear. Cook scrappy bits saving the beautiful heart. Leaves and stems cooked for a very long time; a trip to the food processor in appropriately sized batches. With plenty of stock, send the ugly mess to the food mill. Turn the handle and a smooth puree exudes. This machine was so cheap years ago. No longer. Do you have thrift stores in New Zealand? Anyway, find one. Invaluable. This looked so good I had to make it! I used the Whittakers L&P white chocolate (love that stuff). I noticed after whipping the cream that the recipe doesn't say when to add the sugar (unless I missed that line?) so I added a couple of tablespons of icing sugar at that stage.